Our windows are our eyes to the world. We need them clean and shiny but with all the dust and pollution in London, keeping our windowstransparent appears to be pretty difficult. Because of that, the constantly rising demand on professional cleaningis obvious. That pushed us to offer window cleaning services, affordable and easy to get. Born in the need and entirely focused on practicality and sheer quality for the customer, we do our best to deliver better and better performance every single time. So what makes our window cleaning in London better? 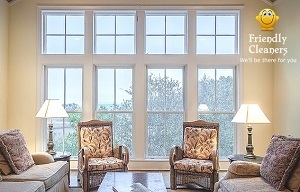 Are you looking for a way to make your windows shine without having to fork out for an expensive service? Friendly Cleaners has the answer; we offer first-rate window cleaning services at highly affordable rates. And with our established history of high quality customer service, you can be sure that you’ve chosen the right people for the job. No matter how dirty your windows are, our fully trained window cleaning specialists are available seven days a week to help solve your window cleaning dilemmas. All of the work we do is guaranteed 100%,so peace of mind comes as part of the package. We only ever use eco-friendly chemicals, even when performing mattress cleaning, and we always leave your windows sparkling and streak-free. Whether you need a one-off window cleaning service or a regular visit – daily, weekly or monthly – our highly trained window cleaning professionals are here to help. For more information or to book a visit now, please call us on 020 3404 5124 or book an appointment online today. We’re waiting to hear from you! Before you make a booking you must agree with our Terms & Conditions. Window cleaning – “ I used Friendly Cleaners when needed to clean the windows of my house. The cleaning team was friendly and worked hard to abolish every single stain of my windows, I was happily surprised that they cleaned the ledges and handles of the windows as well! Thank you and see you again!"